Wood utilized for building up the wood-based pavilions mainly came from sustainable and certified forests in Central-Europe. 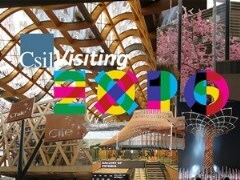 Among others, wood is guest star in following pavilions: France (1,570 m3 fir and larch glued-laminated beams (Glulam). Structures: Simonin SAS, France), China (250 m3 Glulam. Structures: Stratex spa, Italy), Angola (Glulam and X-LAM panels. Structures: Wood Beton spa, Italy), Spain (1,000 m3 Glulam and X-LAM panels. Structures: Albertani Corporates spa, Italy), Austria (Glulam and X-LAM panels. Structures: Rasom Wood Technology, Italy), Coca-Cola (250 m3 fir Glulam, 150 m3 X-LAM panels. Structures: LignoAlp Damiani-Holz, Italy), The Tree of Life (120 m3 larch Glulam. Structures: Wood Beton and Albertani Corporates, Italy. Height: 36 m, upper diameter 40 m), as well as various Clusters and service architectures, not to mention Pavilion Zero and Expo Center (45,500 m3 solid wood. Structures: Wolf Haus, Italy). Having been utilized both for structural use and for flooring and wall covering, as well as a smart decorative element and for the beautification of pavilions, wood proved to be extraordinary versatile. The Austrian company Egger supplied lightweight boards, laminated flooring and other innovative products for the German pavilion. The Italian company Galloppini Legnami created a wooden artwork for the Japanese pavilion with a high decorative impact. The same is true for other countries’ pavilions like Azerbaijan, Belgium, Chile (made of ‘pinus radiata’ local softwood), Estonia, Ireland, Malaysia, Russia, Romania, Slovakia, Slovenia, Thailand, where wood architectures stay definitely in the foreground. At the beginning of the project, the main structure of the Tree of Life should have been made of steel, with wooden elements utilized as pure decorative coverings (some 500,000 kg of steel and 100m3 of glulam were expected to be used). Further to a depth revision of the initial project, Ing. Spatti of Wood Beton spa modified the structural study in a way, that the central, upper and lower parts of the tree have been built using structural wood (larch glulam from Siberia and Switzerland), without directly sustaining steel elements. This solution allowed saving about 350,000 kg of steel with an increase of just 20 m3 of wood. 36 m heigh, the Tree of Life rises in the middle of Lake Arena, a large water basin capable to host some 20,000 people and symbolizes Mother Nature’s roots, growth and life energy.